Star Ferry Musings : SFM #37: Food. Durian, Friend or Foe? SFM #37: Food. Durian, Friend or Foe? 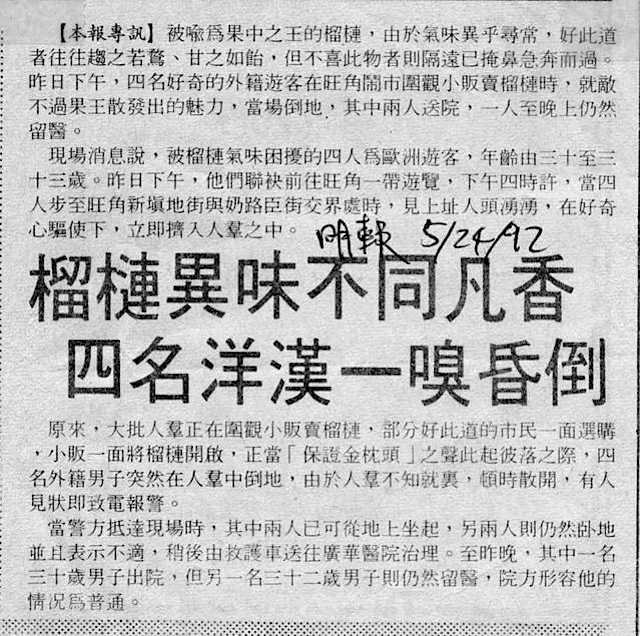 In 1992, I read the following newspaper article in MingPao 明報, a reputable Hong Kong newspaper. It was not April 1st, so it was not an April’s fool joke by the newspaper. 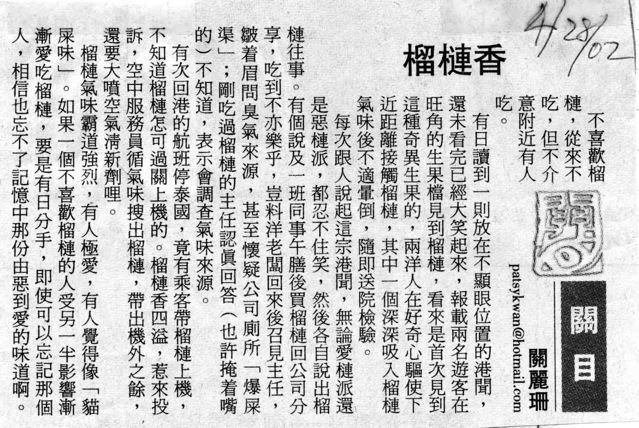 The article stated that four European tourists saw a crowd of Chinese shoppers on a Monkok street. They edged into the crowd and saw a hawker selling durians to the enthusiastic shoppers, and opening the durians for them. The crowd scattered when the four Europeans suddenly fainted among them, and someone called the police. When the police arrived, two of the Europeans already sat up, but the other two remained prone, complaining about feeling unwell. They were taken by ambulance to hospital for treatment. Three tourists were discharged, and one was hospitalized with satisfactory condition. Ten years later, I read a columnist wrote about a similar article. She stated that she read recently a newspaper article that made her laugh out loud. The newspaper stated that two Western tourists saw durians being sold at a fruit stand in Monkok. They approached the durians to see this strange fruit when one of them fainted after smelling the durian. He was sent to a hospital for treatment. The first article was funny if slightly incredible. But knowing how overpoweringly odorous durians are, it is not beyond belief that strangers to it may react strongly. But reading a similar story ten years later makes me think this story to be an urban legend. A search of the Urban Legend web site does not turn up any story of durian being a chemical weapon of mass destruction. So did Western tourists faint from smelling durian or is it a myth? 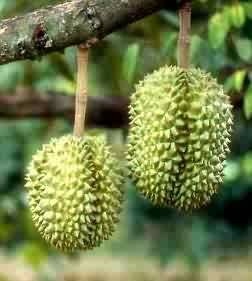 Durians have been controversial for a long time. People who don’t like them call them stinky like old socks, sewage, cat dropping, or garbage. These people have usually not been able to put the fruit past their noses, and therefore have no idea of the taste. They object based on half of the fruit’s attributes. 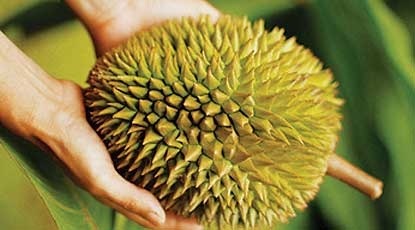 To durian aficionados, the whole sensory experience of the durian is the attraction of the fruit. They may love or hate the smell, but they universally love the texture and the taste. Like all connoisseurs, they have their favorite kind of durian, location of growth, and ripeness of the fruit. Some are addicted to it and must eat durians when they are in season. Not all Westerners are repelled by durians. I was in Singapore with an American colleague when we saw a durian stand. He heard about this legendary fruit and wanted to try its taste. He had no objection to the smell and enjoyed the fruit, declaring he would eat it again if he had the opportunity. Another durian devotee made. Durians grow on tall trees in SE Asia. it is said that a family can live comfortably on the income from a single durian tree. When the fruit is ripened, it would fall from the tree, getting damaged. To protect their assets, durian farmers string nettings under durian trees to catch falling fruits. 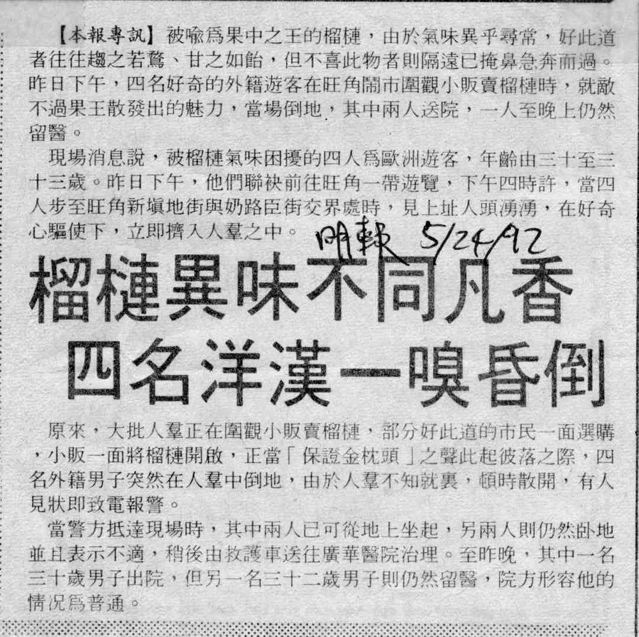 We cannot find Malaysian durians in Hong Kong since they are said to be so good they are all consumed locally, leaving none for export. I bought one Malaysian durian at a farm stand set among durian trees in Malaysia, and I was disappointed by its lack of smell and lack of the signature durian sweetness. We usually find two kinds of Thai durians in Hong Kong. Most people like the more expensive morn tong, or golden pillow 金枕頭 for their meaty fruit and sweetness. The other one is chanee 青尼 which is less sweet with an onion-like pungency. Durian gets its name from the Malay word duri for thorns. It looks like the medieval weapon mace and a person can be seriously injured if hit by a falling fruit. The thorns are hard and sharp, making the fruit difficult to handle. 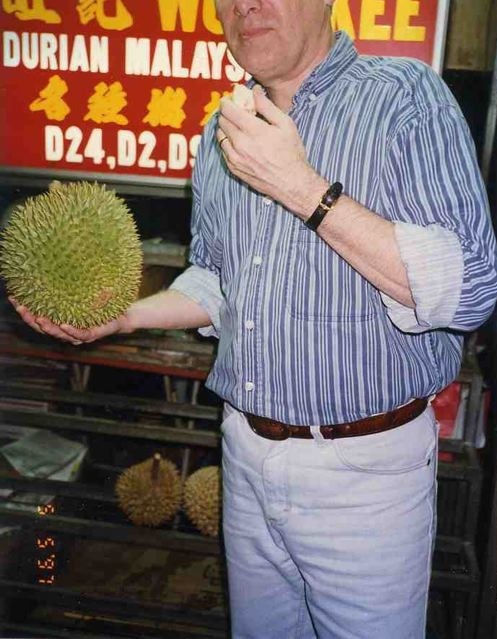 This person holding the durian with his bare hands is probably holding it gingerly and just long enough for the photographer to press the shutter. The first person who tasted durian must be ranked as one of the bravest person in mankind, along with the first person who ate an oyster. Durian is an acquired taste, like smelly cheese and smelly tofu 臭豆腐. Last year, a Thai researcher announced he developed a new breed of durian that does not smell. While some people praised this as an achievement worthy of the Nobel Prize, true aficionados decry this as sacrilege. Why bother to eat durian if it lacks the smell, they ask. Tasty food comes from a combination of sensory buds on the tongue as well as in the nose, and removing olfactory input diminishes the enjoyment by half. The opened durian is a sight of heaven for durian lovers. The fruit is crunchy when green, its fleeting sweetness is tinged like raw onion, and the husk is difficult to open. As it ripens, the fruit becomes softer like banana, becomes smelly, and tastes sweet. 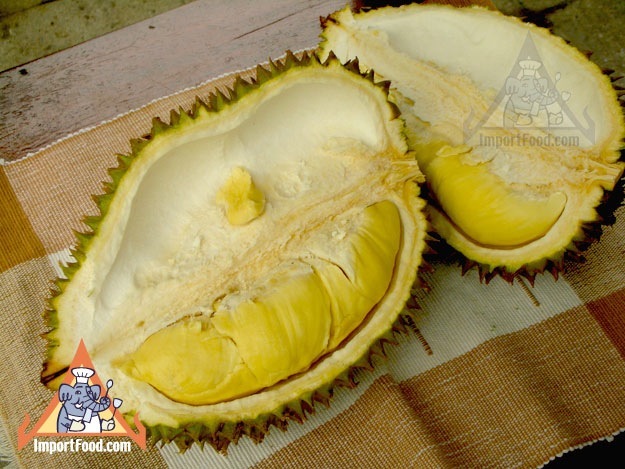 When a durian is fully ripened, the husk can be opened easily. It would smell strongly, have the texture of custard, and a taste of heavenly sweetness. Some people like their durian overripe when the fruit gets watery mushy but very sweet and stinks to high heaven, but this is getting eccentric. Sally and I have refrained from eating durians in recent years believing it to be high in saturated fat and not healthy, as are many delicious foods. As we age, we have to refrain from many of our favorite foods such as coconut, butter cakes, squids, and creamy deserts. Sometimes I wonder if a long life without good food is worth living. But in doing research for this article, I happily found durian to have zero saturated fat content. Sally and I will start eating durians again. yea! For those people new to durian, I would suggest they give the fruit three tries. Durian chips, paste, dried pieces, or candy don’t compare with the real fruit and would convey the wrong impression about durian. It may take three tries to find the ripeness, texture and sweetness that fits the individual’s palate. If one still dislikes durian after three tries, I would say that person has a legitimate reason to hate durian. Sally, for one, tried durian a few times before she began to like the fruit. Posted by Robert Wu on Tuesday, January 13, 2009, at 5:47 am. Filed under Uncategorized. Follow any responses to this post with its comments RSS feed. You can post a comment or trackback from your blog.